We had the most amazing holiday in Ibiza staying in this beautiful villa. The villa was immaculate the views were beautiful and the owners couldn't do enough for us. We will definitely be staying here again. You are very kind.Thank you very much! We just arrived at Ibiza to enjoy the flowering of the almond trees in february. The whole island and specially the valley of Santa Ines is covered with white blossoms.We have sunny days of 18 degrees and spring is everywhere. The place is a class of its own.The view over the sea and the habour of Ibiza is indescribable beautiful. The very well maintained little house and garden makes us enjoy our stay even more. still and the sun shines beautifully over the sparkling sea. Thank you for this beautiful picture. Ibiza is still the paradise island with hippy flair that it was already 40 years ago. The beaches are wonderful and the people are happy. We stayed this time in the Ibiza Vista in the hills of Talamanca near Ibiza. The house is beautiful and very well equiped.Everything was in perfect conditions.On top we had superfast 20G WLAN internet. The only real bad thing was......that we had to go back home ! It is true.This flair is still in the air. Love & Peace from Ibiza. If you can't wait for heaven just book the Ibiza Vista. Enjoy the light atmosphere in a hallucinative location. No doubt this is the most beautiful place of the island. The "IBIZA VISTA" is situated in a stunning hillside location overlooking the bay of Talamanca in close proximity to Ibiza Town and Jesus. 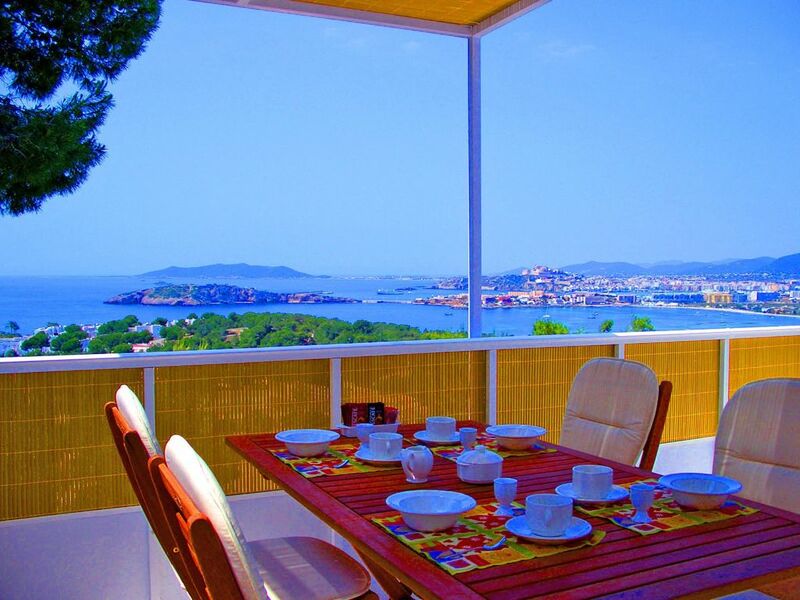 The magnificent panoramic views of Ibiza Town and the beautiful sea view you will find in all areas of the house. Enjoy the peace and nature joined to an exclusive residential area with the advantages of a central location. 4 km to the historic old town of Ibiza. 3 km to Jesus. 1 km to the supermarket. 1 km to the sandy beach of Talamanca. 11 km to the airport. Extensive pine forests close to the villa colony. Ideal for jogging and enjoying the nature.